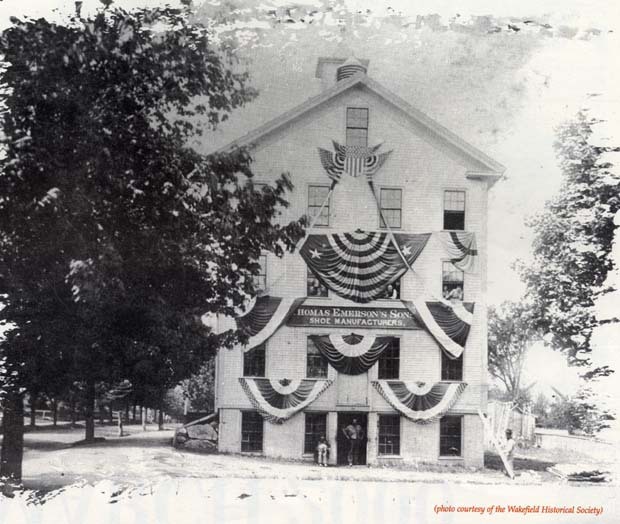 "Decorated for the Town's 250th anniversary celebration, the Thomas Emerson's Sons Shoe Manufacturers was located where the Wakefield and Reading YMCA building now stands. Manufacturers of gentleman's dress shoes, the company had its offices on Summer Street in Boston, with its factory in Wakefield. The '1894 Business History of Wakefield' reported that the company was founded in 1805 by Thomas Emerson, and was the oldest shoe manufacturing establishment in the United States. Thomas Emerson was joined by his sons, Thomas 'the second,' as a partner in 1837, and James Emerson in 1851, at which time the name was changed to 'Thomas Emerson & Son.' Another name change, to Thomas Emerson's Sons, came into effect with the retirement of the founder in 1854. The addition of 'labor-saving machinery' necessitated the expansion of the business and its move from Albion Street to the Yale Avenue/Main Street site in 1863. The Thomas Emerson's Sons factory closed in 1902. The factory building was razed to make way for the YMCA." -- Text from calendar by Jayne M. D'Onofrio. “Thomas Emerson's Sons Shoe Manufacturers, corner of Yale Avenue and Main Street, May, 1894,” NOBLE Digital Heritage, accessed April 20, 2019, https://digitalheritage.noblenet.org/noble/items/show/7099.